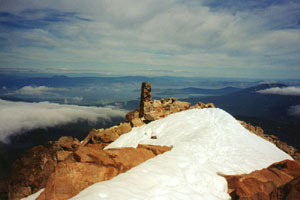 9495 ft (2894 m) . 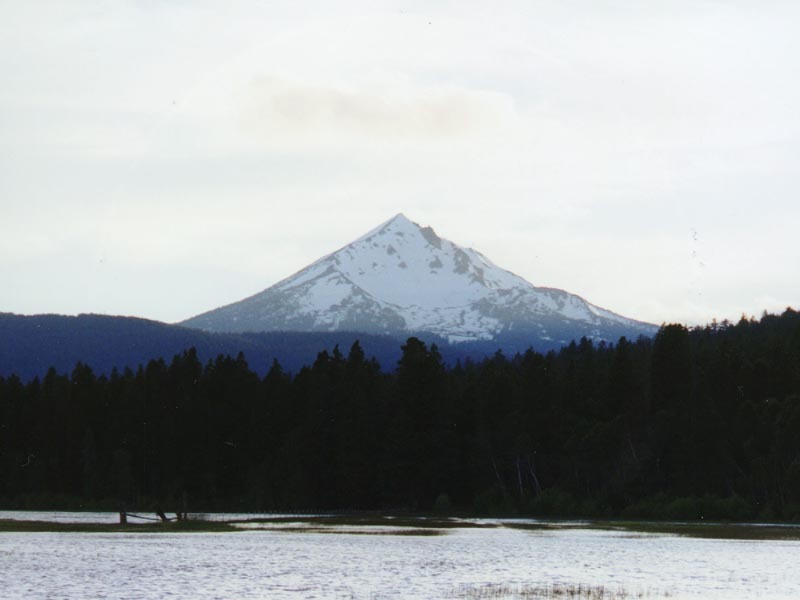 Mount McLoughlin is the highest peak in southern Oregon, a beautiful near-symmetrical volcanic cone. Despite being the highest point in a 200-mile stretch of the Cascade Range between the Three Sisters and Mount Shasta, McLoughlin is relatively unknown and often overlooked. Although not presently glaciated, two huge glacial cirques carved into the north and northeast faces during colder epochs have exposed the very roots of the volcano's lava conduits and removed nearly all traces of the summit crater. These bowls provide over 2000 vertical feet of steep and spectacular ski terrain, easily accessed from the standard trail to the summit along the east ridge. In contrast, the west, south, and east slopes are smooth and uneroded, providing superb, steep fall-line cruising for over 3000 feet. 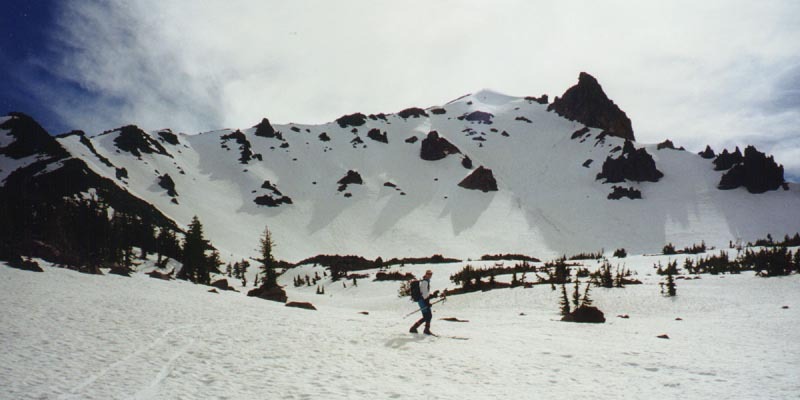 McLoughlin makes an excellent, uncrowded day-trip from late winter through late spring, and the variety of skiable aspects would make repeat trips well worthwhile. 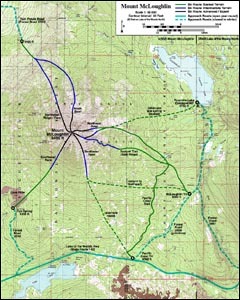 (16 km) This route follows the path of the summer hiking trail up the East Ridge of McLoughlin. When snowcovered the trail is difficult to follow, but it is easy to simply head uphill until tree line is reached near 8000 ft, and then follow the rocky ridge or steep snow slopes just south of it to the summit. A variety of descent options are available, including simply skiing back down the slopes just south of the ridge. 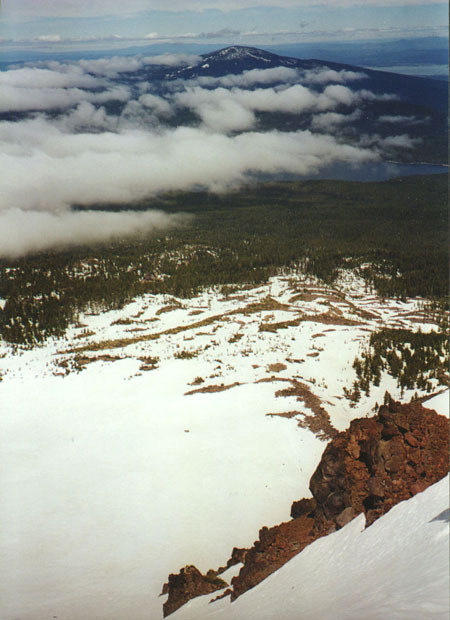 (18 km) The Northeast Bowls of Mount McLoughlin are easily the finest ski descent in Southern Oregon, with a sustained 45-degree pitch in the upper sections and nice open cruising below. From the narrow summit crest, the steepest route drops initially into the North Bowl, then traverses immediately east through a gap into the head of the Northeast Bowl. See my ski trip report from June 1999. It is also possible to drop into the bowls lower from down on the East Ridge near 9000 ft. From the lowest open terrain in the bottom of the cirque, there is a long descending traverse though the woods to Freye Lake in order to return to the normal trailhead. This could be avoided in late season by starting instead from Fourmile Lake Campground, and heading southeast through the forest to the bottom of the Northeast Bowls and then joining the standard ascent route near 8000 ft.
(18 km) There are several shallow bowls on the southeast side which angle away from the summit trail as they descend towards tree line. Skiing these routes from the normal trailhead requires a long traverse through the woods to get back. Another option, especially useful in early season when the Forest Service road to the summit trailhead is snowcovered, is to start from the Pacific Crest Trail parking area on Highway 140. Ski the snowcovered trail northward, until it crosses the standard summit trail after 3 miles. 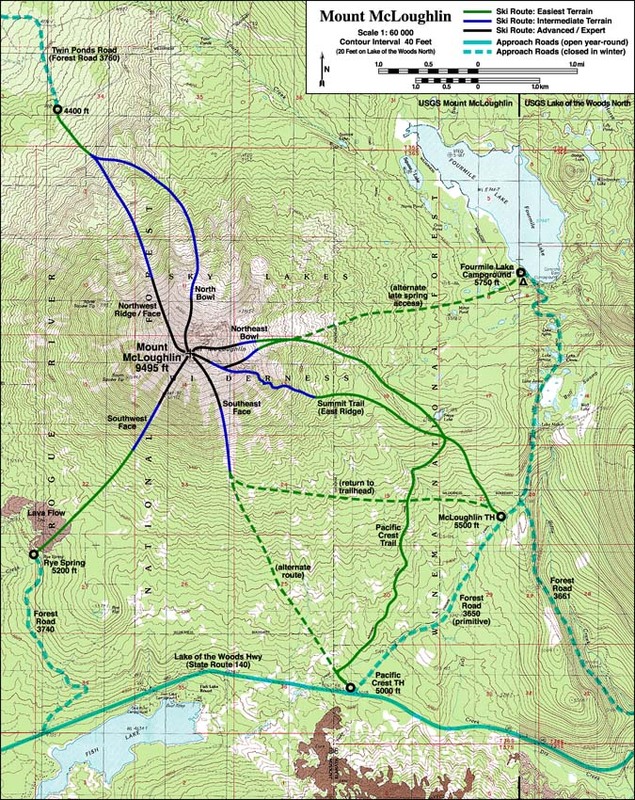 Or one could simply angle northwest through the relatively open forest, and then head directly up the Southeast Face to the summit. 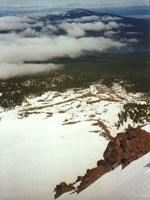 (10 km) The shortest and most direct approach (when snowcovered) to the summit of Mount McLoughlin begins from Rye Spring, just southwest of a lava flow on the southwest flanks. 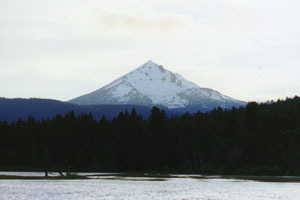 The route heads directly northeast across the lava flow and then straight for the summit, up steepening snow slopes which eventually reach a sustained 35-degree pitch for the uppermost 1000 vertical feet. However, due to its windward and southwesterly aspect, this slope tends to lose its snowcover somewhat earlier than other routes. (11 km) A little-used road to the Twin Ponds trailhead provides access to the remote northwest side of McLoughlin. Although this route begins much lower than the standard summit trail, it makes up for it by being much shorter and more direct, following open slopes to the shallow bowls of the Northwest Ridge. The descent can return via this route or drop into the steep, open expanses of the North Bowls, rejoining the ascent route with minimal traversing below 6000 feet. These bowls offer excellent skiing to match that of the NE Bowls.